Consider a normal shock in which the flow upstream and downstream of the shock front is parallel to the -axis, and front itself lies in the - plane. (See Section 14.8.) Suppose that and are the upstream and downstream flow speeds, respectively. Let us now view this shock in a frame of reference that moves with respect to our original frame at the constant velocity . As illustrated in Figure 15.1, viewing the shock in the new reference frame has the effect of adding a component of velocity of magnitude , directed parallel to the -axis, to both the upstream and the downstream flow. The resultant upstream velocity is now of magnitude , and subtends an angle , known as the wave angle, with the shock front. It is evident that may be adjusted to any value via a suitable choice of . Now, because is not the same as , the inclination of the downstream flow to the shock front is different to that of the upstream flow. In other words, the direction of the flow turns abruptly as it passes through the shock. Because is always less than (see Section 14.8), the deviation is always towards the shock front. 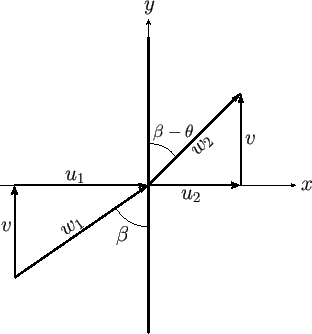 In other words, the deflection angle, , defined in Figure 15.1, is positive. Figure 15.1: An oblique shock. Here, use has been made of the identity . The previous expression implies that at and , which are the limits of the range of allowed values for defined in Equation (15.5). Within this range, is positive, and, must, therefore, have a maximum value, . 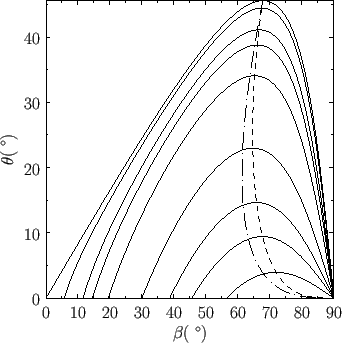 This is illustrated in Figure 15.2, where the relationship between and , for an ideal gas with , is plotted for various values of . Figure: Oblique shock solutions for . The solid curves show solutions for , , , , , , , , and , in order from the innermost to the outermost curve. 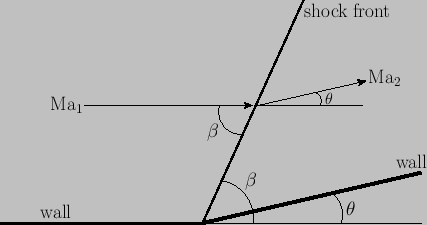 The dashed curve shows the locus of solutions for which . The dash-dotted curve shows the locus of solutions for which . Solutions to the left and right of the dash-dotted curve correspond to and , respectively. If then, for each value of and , there are two possible solutions, corresponding to two different values of . The larger value of corresponds to the stronger shock [because, according to Equation (15.1), the shock strength, , is a monotonically increasing function of ]. Also shown in Figure 15.2 is the locus of solutions for which . In the solution with the stronger shock, the downstream flow always becomes subsonic. On the other hand, in the solution with the weaker shock, the downstream flow remains supersonic, except for a small range of values of that are slightly smaller that . Figure 15.3: Supersonic flow in concave corner.